Posted on Sep 17, 12:24 PM in Brunch. No comments. I had potato cakes for breakfast this morning and started to wonder about how these would be made with sweet potato. Sweet potato is a wonderful food with so many health benefits. It has a low GI, is an excellent source of flavenoids (beta carotene and vitamin A), is high in fibre, Vitamin C and Vitamin B6. 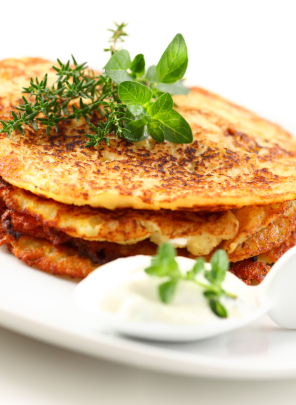 You can make sweet or savoury versions of sweet potato cakes. Here is a simple one you could try for breakfast or brunch. Sift dry ingredients into a mixing bowl. Combine remaining ingredients; add to flour mixture, stirring just until dry ingredients are moistened. Drop by tablespoons onto hot greased griddle or skillet and fry, turning once, until browned on both sides.